Where can I find jet ski insurance in Spain? Is it compulsory to insure a jet ski in Spain? Which companies offer Spanish jet-ski insurance? 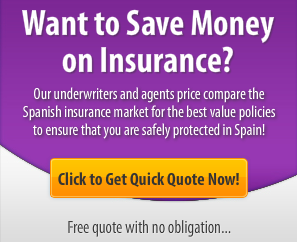 How much is the cheapest Spanish jet ski insurance? For other types of water-based vehicles that you wish to insure such as yachts or powerboats we refer you to our main section on marine/boat insurance. 7. Where is the boat kept? The legal/privacy bit we have to put in – Note that you are using this form to submit your details to us so we can then compare the market and give you options for jet-ski insurance. Our privacy notice at the footer of our website lets you know how we use your data and how to request removal. You don’t need to do anything other than fill in your details and let our brokers do the rest. As discussed below it is compulsory to have insurance for a jet ski in Spain so that you have third party liability should you collide with another person in the sea. Also compulsory is a licence to drive a jet ski (see below). This proves that you have been on an approved training course with tuition so that you are more likely to be able to drive a jet ski safely and be in control of what is a very dangerous machine if you are an inexperienced water-sports enthusiast. The Spanish word for jet ski is Moto Acuática. A jet ski also often is described as a PWC (personal water craft). If you want to go direct to a Spanish insurance company who specialise in providing insurance on jet skis in Spain, we have the source of Morgan Marine as mentioned below. Try also find a price comparison website for marine/jet-ski insurance which will take your specifications and instantly search online and compare prices for the cheapest deals and prices in the market. Always shop around but don’t just choose the cheapest jet ski insurance. Do make sure that it gives you good coverage, especially the third party liability which is incredibly important if you injure somebody in the waters when jet skiing. The insurance brokers listed above all have English-speaking staff who can help and assist you if your Spanish is not fluent. Morgan Marine Insurance Services are a company providing insurance for Jet Skis. Discounts allowed for RYA certificate holders. Cover includes, Accidental Damage, Fire, Theft and Perils of the Sea. Policies available to Ex-pats in France and Spain. Terms and Conditions apply. Is Spanish Jet-Ski Insurance Compulsory? Yes it is now compulsory to be insured when driving the jet ski in the waters of Spain. This legislation was introduced as a result of a number of accidents involving jet-skis and swimmers. The most important element of the insurance policy is a third-party liability insurance which protects against medical claims and damages from somebody who has been injured as a result of a collision with your jet ski. Where Can I Get a Jet Ski License in Spain? One of the issues for English-speaking expats in Spain who wish to own a jet ski in Spain is the licensing issue. As we point out above, it is compulsory to pass a test in order to get a licence to be able to drive a jet ski in Spain. The problem is passing the test when you are not fluent in Spanish. Fortunately there is a way around this problem. There are a number of centres around Spain, although mostly on the Costa Del Sol admittedly, where you can do your test in English. For example there is the Jet Center San Pedro which is an approved RYA Training Center for anyone wishing to obtain a Jet Ski Licence. RYA stands for the Royal Yachting Association. You can undertake a one day course which teaches you how to drive a jetskis safely. At the end of the day if you are successful you will have your license issued. How Much Does it Cost to Get a Jet Ski Licence? You could do a jet ski course in the United Kingdom and it usually costs around €120 to get your JetSki license. Of course if you are already living in Spain then it isn’t worth the time and cost of flying back to the UK to do the RYA approved course so you will need to take a course in Spain which is usually around €300. Getting a RYA license does have the advantage of being recognised in most countries in the world so that should you wish to jet ski elsewhere your license will also be valid.